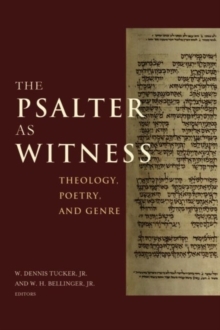 The Psalter as Witness considersthe complexity of the Psalms as well as their role in bearing witness to the theological claims that comprise Israel's traditions. While no single volume can readily capture the full range of the Psalter's theology, these chapters provide richreflection on significant themes in selected psalms, in collections of psalms, and even across the structure of the Psalter itself. The result of the Baylor-Bonn symposium, The Psalter as Witness employs the full array of methodological approaches to the Psalms practiced in both Germany and North America. The Psalter as Witness thus effectively mirrors the theological, thematic, and generic intricacies of the Psalms in the myriad ways interpreters read the Psalter. The Psalms herebecomea window into thecentral, life-givingcommitments of Israel in its call to justice and mercy, its practice of ethics and politics, and its worship and life with God.